What if you could scour the Web for predictions, forecasts, and estimates about what might happen next year, or in a decade? "Recorded Future allows financial analysts, intelligence analysts, and predictors to organize and aggregate future observations with ease," the company explains in a short description on its YouTube channel. On the company's LinkedIn page, the company, founded in late 2009, boasts that its "customers are some of the top government agencies and trading firms in the world." Also involved with Recorded Future as a founding member of the board is Andy Palmer. He didn't return my calls or e-mails seeking information about the company. Palmer did, however, post a completely unbiased comment (using his Twitter username "pigratdog") on the company's YouTube page: "This is an incredibly powerful results navigation interface — truly game changing." I'm told by a local venture capitalist that Recorded Future hasn't yet raised a venture round, but has only received money from its founders and angel investors. And while the Recorded Future interface, with its three input boxes, looks remarkably similar to the travel search site Goby, there's no link between the two companies except for Palmer, who serves on both boards. While conceptually similar, "it's not the same technology," Goby chief executive Mark Watkins told me yesterday. "They're a completely separate company." Neither Flybridge Capital Partners nor Kepha Partners, two local firms that have backed Goby, have invested in Recorded Future (yet). 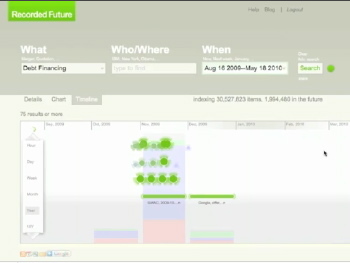 While there are all kinds of questions about how well Recorded Future will do at locating and labeling information about the weeks, months, quarters and years ahead, harnessing the wisdom of crowds with this kind of temporal search could prove valuable. Recorded Future's homepage features a quote from British prime minister Benjamin Disraeli: "What we anticipate seldom occurs; what we least expected generally happens."